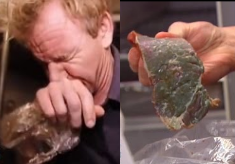 We've all enjoyed Gordon Ramsay finding the gross, rotten food in the walk-in, raw meat stored next to cooked meat, shelves caked in an unknown substance that Gordon insists on digging his fingers in and Gordon screaming his disgust at the people who should really know better. We've enjoyed his outbursts of "Shut it down! ", "No more food is leaving the kitchen" and him gagging at the grossness he has encountered. Here is a run down of all of the most disgusting kitchen inspections on Kitchen Nightmares from the bad to the really bad and the oh so very few good ones, ranked from horrifically bad to acceptable to exceptional, ranked by the barf-o-meter. Dillon's - 10/10 - Gordon discovers fly papers covered in dead flies, a pot of sauce with a ski of mould, mouldy burgers, green chicken and old potatoes that were served to Gordon. Gordon enters the basement and finds thousands of cockroaches before finding rat droppings. There are rotten vegetables and salad in the walk in, half of a rotten tomato is found that has just been served to a customer. Fiesta Sunrise - 10/10 - Gordon finds a dirty kitchen, a pot of old rice and other old, mouldy and rotten food items. He watches a server putting chips that had been out with a customer back into the drawer. The fish is old, slimy and smelling bad and the meat is old and soaking in blood. Gordon gags on the green, slimy chicken. In the walk-in, he finds trays and trays of old precooked food. Gordon finds cockroaches infesting the kitchen, crawling all over plates and counters. Oceana - 10/10 - Gordon inspects the warmer unit and finds milky crabs at room temperature and sour sauce and there are shrimp that are so old that Gordon vomits into a bin. The whole content is tainted. In the fridge, there are half dead craw fish, a tray of precooked pasta, a tray of crabs and crab cakes with no dates and a warm bag of jambalaya. He finds a mice trap with 3 dead mice in. Old Neighborhood Restaurant - 10/10 - Gordon finds that all of the food in the walk-in is cross contaminated, there is a chocolate dessert stored on top of raw meat and also a lot of mouldy and rotten produce. Gordon also finds a dead mouse and meat thermometers stored in a hole in the wall. Trobiano's - 9/10 - Gordon finds the kitchen is caked in grime, the plates in the kitchen are filthy and there are mouse/rat droppings in the kitchen. The Secret Garden - 9/10 - Gordon finds that the ovens are caked in filth and grease, the walk-in is filled with rotten and mouldy food. The fridge itself has gone mouldy and there are maggots in rotten produce. Gordon vomits in the bathroom. Casa Roma - 9/10 - Gordon finds trays of old food, rotten veg and sour meat. No dates on food, meat soaking in blood and rock hard, mouldy parma ham. He also finds a 3 month old rack of ribs that causes Gordon to throw up in a bin. He also inspects the bathrooms, which are vile, bodily fluids everywhere. Spanish Pavilion - 9/10 - Gordon finds a dead lobster in the lobster tank, contaminating the live lobsters with bacteria. Nothing is dated or labelled in the freezers. The walk-in is filled with food. He finds bags of chicken soaking in water. There are dead stinking lobsters - one soaking in the sauce, there are old slimy snails and to top it all off there is a pigeon in the kitchen! Hannah and Mason's - 8/10 - Gordon finds rotten lettuce on a dish about to go out to a customer, an old dessert has been served to a customer and really old grey, bubbling, shrimp leaking in the fridge. In the walk-in, he finds old bacon and masses of old produce and cooked chicken on top of uncooked chicken in the same tray. Finn McCool's - 8/10 - Gordon finds a shelf in the kitchen caked in grime, sour meat and mould on canned artichokes. In the walk-in he finds cooked chicken next to raw chicken, mass cooked food that has gone off, containers of who knows what and the old mince meat that he was served in his Shepherds pie at lunch. Peter's - 7/10 - Gordon looks in the fridge and finds rock hard bread. The fridge isn't working properly so he finds trays and trays of rotted fresh produce. There is also sour meat which appears to be a month old. Seascape - 7/10 - Gordon notices that the kitchen is filthy, the walls and equipment are caked in filth. He finds mouldy pesto in the fridge, that had been served to him the previous day. There is sour pork, that the chef claims is his own and part cooked meat. Lela's - 7/10 - Gordon finds a fridge that isn't even cold at 51 Fahrenheit, the food is going bad and the meat is rotten, sitting in its own blood due to the temperature and there is rotten yoghurt/cheese that Gordon gags upon smelling. Grasshopper Also - 7-10 - Gordon inspects the fridge in the kitchen and finds old chicken, blood from meat in the mozzarella sticks, raw meat next to cooked meat and cross contamination from blood in other produce. In the walk-in he finds slimy chicken and old salmon. Down City - 7/10 - The kitchen is filthy so Gordon inspects the fridge and finds old and rotting food including old lamb bones, stinking chicken carcasses, raw chicken next to cooked pork and something unknown, possibly cheese that is growing fungus or mould. Blackberry's - 7/10 - Gordon finds a dead mouse in the restaurant but no kitchen inspection is made. Leone's - 7/10 - Gordon finds cooked and raw meats together in the fridge, old grey pork, sour mushroom sauce and green flounder. Mike & Nellies - 7/10 - Gordon finds drawers of uncovered raw and cooked meats together, a lot of old food, sour calamari, week old meatballs and even food left in the oven. Spin-A-Yarn Steakhouse - 7/10 - Gordon enters the cooler and finds raw and cooked meats stored next to each other, unidentified raw meats soaking in blood with no dates and mouldy zucchinis and strawberries. Barefoot Bob's - 7/10 - Gordon finds a warm fridge, chicken breasts swimming in blood, pork belly stored next to a box of hot cooked chicken wings, old pizzas and grease and dirt in the kitchen equipment. Yanni's - 7/10 - Gordon finds a host of rotten fresh produce in the walk-in, old beef covered in mould and the ultimate kitchen sin of raw and cooked meat stored together. Prohibition Grille - 7/10 - Gordon finds sour, separated gravy, a four day old bread pudding and worst of all, raw and cooked meat stored together. Lido Di Manhattan - 6/10 - Gordon finds they are serving 3 day old tuna and are slicing meat days before using it and finds that the kitchen is caked in dust. Mama Rita's - 6/10 - Gordon finds packets and packets of pre-prepared frozen food made 2 months to a year ago. There are some mouldy food items, limes and other fresh produce. No comments are made on cleanliness of kitchen/walk-in/storage so assume that was of a high standard. J Willy's - 6/10 - Gordon finds chicken in the warm kitchen soaking in blood, rotten potatoes, tomatoes and peppers. Jack's Waterfront - 6/10 - Gordon finds trays of old fresh and pre-cooked food, rotten tomatoes, sour meat soaking in blood and grey chicken. Sushi Ko - 6/10 - Gordon finds that the mayonnaise is not being refrigerated after being opened and that the fridge is broken, there are boxes filled with ice to cool the produce and there are dairy and meat products in the fridge. Park's Edge - 6/10 - Gordon finds old, sour meat and rotten and rotting vegetables in the walk-in. Levanti's Italian Restaurant - Gordon finds old, slimy chicken, cod in water, unknown green substance, fermented sauce with mould. Chappy's - 6/10 - Gordon finds three year old mayonnaise and a mountain of old meat and rotten vegetables in the walk-in. Kati Allo - 6/10 - Gordon finds mouldy produce, trays of mouldy food and jars that are over 10 years old in the walk-in! Bella Luna - 6/10 - Gordon finds food covered in mould and rotten and rotting food. He also finds chicken defrosting in the sink and sees the chef defrosting shrimp in a microwave. Sante Le Brea - 5/10 - Gordon isn't impressed by the grass growing in the restaurant or the fishy salmon from the freezer. He finds salmon and turkey defrosting in the same container and a mouldy eggplant. Handlebar - 5/10 - Gordon finds that the food isn't labelled in the fridge, the back of the fridge hasn't been cleaned and he finds a very old clam. The cooker is filthy, Gordon runs his finger along and it is caked in oil. Fleming - 5/10 - Gordon finds cooked duck in the same tray in the walk-in as meat defrosting in blood. Sam's Mediterranean Kabob Room - 5/10 - Gordon finds rotten tomatoes, bendy celery, soft zucchini, rotten lettuce and raw chicken about to be served to a customer. Bonapartes - 5/10 - Gordon finds old lentils, furry potatoes and something unknown aka a "sheeps turd". Campania - 4/10 - Gordon finds open mussels but no further comments on cleanliness or food issues. Sabatiello's - 4/10 - Gordon comments that the kitchen itself is spotless but in the fridge in the kitchen he finds pre-cooked chicken next to raw chicken and an old chicken dish. Zayna Flaming Grill - 4/10 - Gordon finds warm water dripping onto frozen meat. La Galleria 33 - 4/10 - Gordon finds dirty, open mussels in the upstairs fridge, rotten onions downstairs and a lot of frozen pasta in the freezer. La Lanterna - 4/10 - Gordon finds that the kitchen is filthy and there is some rotten produce in the fridge. Ruby Tates - 4/10 - Gordon finds pre-prepared lobster with the poo sack still inside and mussels that are dead and open. The Priory - 4/10 - Gordon finds old half eaten joints in the walk in, old, rotten bits of meat and warm joints of meat wrapped in cling film. There is a bucket of broccoli soup that was finished "yesterday". Capri - 3/10 - Gordon inspects the kitchen and finds grime caked on everything. In the fridge he finds old produce and hot tomato sauce. PJ's Steakhouse - 3/10 - Gordon finds rotten and mouldy lemons, tomatoes and lettuces. The low score reflects that it appears no one was actually the lemons as they were using bottled lemon juice. Mama Maria's - 2/10 - Gordon finds an endless mountain of badly frozen produce with no dates , meat suffering from freezer burn and some produce has mould. Nino's Italian Restaurant - 2/10 - Gordon finds mushrooms all over the floor, old produce and buckets of old food from "Friday". Olde Hitching Post Restaurant & Tavern - 1/10 - Gordon finds frozen meatloaf and milky and fishy scallops. Cafe Tavolini - The kitchen floor is covered in tickets and cluttered but no hygiene concerns are raised. Sebastian's - Gordon inspects the freezer and walk-in, he makes no comments on cleanliness, he only comments on the amount of food in there. Mojito - Gordon inspects the walk-in, he makes no comments on cleanliness or food safety concerns, he only comments on the amount of food in there. Black Pearl - Gordon enters the walk-in to see the lobsters but no comments are made on cleanliness/food storage. Cafe 36 - Gordon enters the walk in but makes no comment on cleanliness or food safety only comments on the frozen food defrosting in water. Michons - Gordon finds mounds of precooked chicken from 6 days ago but no comments are made on cleanliness/food storage. Charlie's - Gordon finds a lot of frozen food but no comments are made on cleanliness/food storage. Ms. Jean's Southern Cuisine - Gordon finds dry chicken from lunch at a dinner service but no comments are made on cleanliness/food storage. Mill Street Bistro - Gordon finds a lot of frozen food including blue cheese and seafood including oysters but no comments are made on cleanliness/food storage. Mangia Mangia - Gordon finds over 400 portions of pre-cooked pasta but no comments are made on cleanliness/food storage. Moore Place - Gordon finds packets and jars but no comments are made on cleanliness/food storage. The Fenwick Arms - Gordon finds a lot of plates and a lot of kitchen equipment but no comments are made on cleanliness/food storage. The Mixing Bowl, Bazzini, The Olde Stone Mill, Giuseppi's, Hot Potato Cafe, Flamangos, Le Bistro, Anna Vincenzo's, Classic American, Davide, Kingston Cafe, La Frite, Zeke's, Luigi's D'Italia, Burger Kitchen, The Greek at the Harbor, El Greco, Cafe Hon, Chiarella's, Zocalo, Amy's Baking Company, Pantaleone's, The Glass House Inn, D-Place, Momma Cherri's, La Riviera, Oscars, The Sandgate Hotel, Clubway 41, La Gondola, La Parra de Burriana, Morgans, Rococo, Piccolo Teatro, The Fish and Anchor, The Curry Lounge, The Granary, Runaway Girl, Martin's Bistro - No kitchen inspection in episode, will assume everything was of a high standard. I seem to remember on Anna Vincenzo's that he looked in the freezer and was not happy at certain items being frozen. Wasn't it in that episode where there was frozen blue cheese?